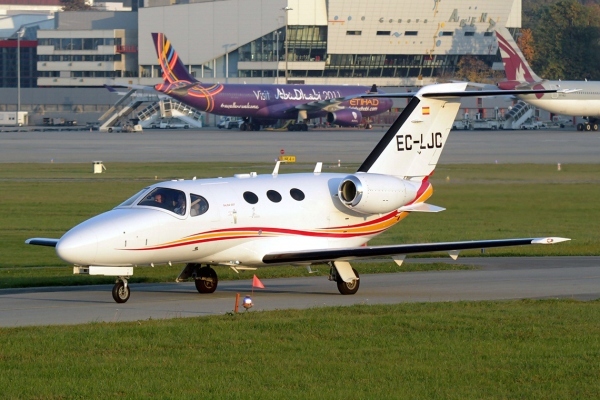 In the aircraft market there are a number of used Cessna Citation Mustangs for sale. The Cessna Mustangs for sale that we have seen are priced from $1,900,000 to $3,000,000 USD. We are building our Cessna Citation Mustang For Sale - Cessna Mustang For Sale page with listings of Cessna Citation Mustangs for sale. Cessna has pricing for a new Cessna Citation Mustang for sale in the $3 million to $3.2 million dollar range depending on the options chosen for the Cessna Citation Mustang. Also available from Cessna is the Cessna Citation Mustang High Sierra Edition. The Cessna Citation Mustang High Sierra Edition is a special, limited edition Cessna Mustang for sale that has a special livery, upgraded interiors and has optional items such as synthetic vision technology included. When buying a new Cessna Citation Mustang for sale from Cessna you get training for 1 pilot and 1 mechanic on the Cessna Citation Mustang. If you have a Cessna Citation Mustang for sale, contact the Aviation Resources Team to learn how you can list your Citation Mustang on our website. Above Cessna Citation Mustang For Sale Page Photo by Patrick Mutzenberg on Wikimedia Commons. Photo (only) released under the GNU Free Documentation License, Version 1.2. For Reference: A Cessna Citation Mustang For Sale is also known as a Citation Mustang For Sale, Cessna Mustang For Sale, C510 For Sale, Cessna 510 For Sale and the CE-510 For Sale.